Today is the day the trial against SCOAN and the engineers begins. Already it has been established beyond doubt that the building collapsed due to structural deficiencies (if you still question that, please first read the coroner’s report then come back to us), but SCOAN are still sticking to their “strange hovering aircraft/controlled demolition/terrorist attack” theories. Below is a repost of an article we wrote a few months ago explaining why these theories are completely inadequate to explain what actually happened on September 12th 2014. Let’s pray these deceptive stories get put to bed for good during this trial and the bereaved families get the truth and justice they deserve. If you lost family members in the disaster, you should know about the civil case against SCOAN. If you are interested in participating, please email tbjoshuawatch@hotmail.co.uk. Footage of a plane “hovering”, almost an hour before the building came down. CCTV footage that appeared to show the building come down symmetrically “like a controlled explosion”. The testimony of “experts” claiming that the foundations and supporting columns were sound. Although it seems to only be SCOAN supporters who take these theories seriously, SCOAN has a lot of supporters, and they’re rather vocal. In this article we look at the three lines of evidence and ask some probing questions that we believe SCOAN should answer if it expects the general public to take them seriously. How did a sonic or chemical attack from an aircraft only demolish one building and leave the adjacent ones intact? Surely any technology if this nature wouldn’t be this directional when deployed from the air? If the building was attacked from the air, how does that explain it appearing to come down symmetrically? If it was chemical, what chemical was used? What traces were found of it on the site? How could the chemical be potent enough to destroy a building, but without causing any loss of life outside of the building? What does the airplane have to do with controlled demolition? These appear to be mutually exclusive theories. Unless SCOAN can answer some of these questions and give some more details to explain why the appearance of a plane an hour before the collapse had anything to do with it, we think it is a complete red herring that can be rejected out of hand. So we will put aside this line of evidence and move on to the next. Some examples of genuine building implosions. How did terrorists gain access to structural data on the building in order to plan a controlled demolition? How did they get large quantities of explosives and other paraphernalia onto the site without being stopped by the armed security guards or caught on CCTV? How did they manage to drill into multiple points on the building to rig the explosives without being noticed or caught on CCTV? If the collapse was caused by explosives, why were there no reports of loud bangs? Why were all the injuries consistent with crushing, not burns and explosions? Were any traces of explosives or associated paraphernalia found on the site? Please give details. Who do you think was responsible for the attack? Why has nobody claimed responsibility? Why would a terror group go to the bother of executing a highly sophisticated attack, but neglect to claim responsibility? If you really do believe that your site was compromised to the extent that terrorists were able to prepare and execute this controlled demolition, what measures have you taken to ensure it won’t happen again? Have you had bomb disposal experts check the whole site? Why were you allowing large public gatherings to take place just days later? Either this was highly irresponsible, or you don’t believe your own stories. Ironically, if we are to take the controlled demolition theory seriously (which we don’t) it actually ends up implicating SCOAN far more than the structural failure option. Executing a plan like this would have required such high level access for lengthy periods of time, doing indiscreet things like drilling into columns and laying wires that it is inconceivable that the building could have been demolished this way without it being an inside job. If SCOAN want this line of evidence to be pursued, they should be ready for all SCOAN staff and contractors to be treated as suspects. Structural failure would be criminal negligence, controlled demolition would be mass murder. Why did the video only concentrate on a very small exposed part of the foundation? How do we know you weren’t just showing the part that was intact? If you are convinced that your structure was sound, why didn’t you pay for a nationally recognised impartial expert to produce a full, comprehensive report and make it public? If this report countered the findings of the coroner’s witnesses, you might have a point – but a few quotes on video from 4 “experts” with questionable credentials looking at a tiny exposed part of the foundations tells us nothing. To conclude, the plane theory is nothing short of crazy, the controlled demolition theory is far fetched (but if it’s to be believed actually implicates SCOAN) and the expert testimonies are woefully inadequate, little more than soundbites from people on the street. If there was any credibility at all to these claims, surely TB Joshua would have turned up in court to present the evidence? Since he refused (4 times) to do this, SCOAN should do the victims families a favour and either shut up about their so called evidence, or do it properly and provide something substantial and believable. Not much going on in TB Joshua-land at the moment except for repeats of old material, so we’ll join the club and repeat one of our old articles. If you missed this the first time, read on to see evidence that nobody is really delivered at SCOAN. A reader recently made us aware of a video of the ex-Pastor of SCOAN Athens being delivered over a year ago from a “spirit of lust and anger that caused him to be disgraced”. This is the same man who is now the subject of allegations of sexual abuse from 4 young women, and was recently described by Wise Man Harry as a “rude, disobedient, disrespectful and full of anger man”. At the time of the deliverance, SCOAN Athens was still a fully functioning official branch. 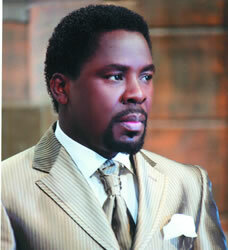 The man being delivered from demons was the pastor authorised by TB Joshua to lead this branch of his ministry. There are videos online of nearly all the foreign SCOAN leaders and disciples being dramatically delivered from demons, which leads you to wonder why they were ever chosen to lead within SCOAN? Who wants to be part of a church who’s leaders are crawling with demons? As it happens, the people who we know who have dedicated their lives to SCOAN were exemplary Christians, the fact they sacrificed successful careers, education and many other things to pursue full time ministry at SCOAN is testament to their desire to serve God with everything they had. These were exactly the kind of people you would be happy to see in church leadership…. nothing like the crazed, staring, demon-manifesting people we see after years of service to SCOAN. If this is what SCOAN does to you, keep as far away as possible. Or at least it didn’t seem to work in the case of the ex-Athens pastor, and this is far from the only deliverance fail we are aware of. Many years ago TB Joshua conducted a crusade in Australia. There was a well broadcast deliverance of a woman during this crusade, culminating in TB Joshua proclaiming her free, and even bizarrely claiming that her deliverance resulted in 5000 other people being set free. Giles was a disciple at the time, he says that “she later came to Lagos, and I was surprised to see her no different. She had come for more deliverance, and she was behaving the same way. Obviously she was not delivered in Australia.” There are also the well publicised cases of Nigerian celebrities such as Tonto Dike and Jim Iyke who TB Joshua has famously delivered, but without resulting in any visible change in lifestyle. This is more evidence that you can’t trust anything you see on Emmanuel TV. I wonder why today’s men in religion like publicizing deliverances and even bringing shame on those being delivered. Is this the way and will of God? Is it a way of attracting people for business or what? I would rather watch someone preach the word on TV and the rest should be done off TV or off screen. We need the word of truth on TVs more than deliverances and miracles. In fact Satan is more scared of the truth than miracles/deliverances. The truth liberates and the pure word of God is like fire. Will SCOAN get away with a paltry $1250 fine? 2. By prosecuting the SCOAN for failure to obtain permit, the worst penalty the church will suffer is a fine of around N250,000. 5. In essence what will happen is that T.B Joshua and his church will pay a paltry N250,000 for causing the death of 116 people. 6. This is a confirmation of my worries of the unfortunate behaviour of Fashola when the building collapsed. 7. Throughout last week I was given the run around by the Perm. Sec. Of the state Min. Of Justice, Lawal Pedro. I know something was fishy. 8. For political reasons, perhaps, the state doesn't want to bring the full pressure of the law on T.B Joshua. 9. The Lagos govt saw a weak scape goat in the engineers and are using them as red herring. 10. The implications of not prosecuting T.B Joshua and his church for criminal negligence as the coroner recommended is far-reaching. 11. First, the dead and their families will be denied real justice. 13. Lagos govt is telling the world that some personalities are above the law & cannot be punished even if they killed 116 people. Perhaps we’ll be seeing TB Joshua’s return from Mexico soon?